MCT is not just a buzzword. It’s one of the most bioavailable sources of energy. MCT oil is made by extracting medium-chain triglycerides (MCTs) from coconut and palm oil. MCT oil can be the combination of the two fatty acids C8 and C10, or pure C8, and you can find it in powder or oil form. Research finds MCT oil can aid healthy weight loss and fat loss, boost brain power, support gut health, increase energy levels, and help control hunger. On the ketogenic diet, MCT oil is a source of fat that can quickly boost energy levels by increasing ketone production effectively. It has these health benefits because, unlike other fatty acids, MCTs don’t get stored as body fat. Read on to learn how it works and why it’s so good for you. MCT oil is the combination of the two fatty acids C8 and C10, or pure C8, extracted from coconut and palm oil. MCTs make a quick energy source because they don’t rely on other enzymes for absorption in your body. The oil is made from pure MCTs extracted from whole foods, specifically coconut and palm oil. Let’s take a closer look at each medium-chain fatty acid. MCTs are known for being quickly absorbed by your body and metabolized into energy in the liver. They’re the most efficient saturated fats in terms of energy production. They create ketones, an energy molecule. Ketones are an amazing source of energy for your body in comparison to glucose because they produce far less molecules that react with other molecules when they are metabolized. If you’re wondering why your MCT oil tastes a bit off or creates a tingle in our throat, it most likely has too much caproic acid (C6) in it. While it doesn’t taste the greatest, there’s usually not enough of it in coconut oil or MCT oil to taste it. It converts quickly to ketones. C6 makes up about 1% of the total MCTs in coconut oil. Caprylic acid makes up 12% of the MCTs in of coconut oil. This type of MCT helps you maintain a healthy gut thanks to its strong anti-microbial properties. This is the most efficient fatty acid after C6 because it converts rapidly into ketones in your liver. That’s why it’s the main fatty acid in MCT oil, as we’ll see later on. Like C8, C10 turns into ketones quickly in the liver. It’s a little bit slower than C8 during the ATP process, and makes up 10% of MCTs in coconut oil. Lauric acid makes up 77% of MCTs in coconut oil. Like its fellow MCTs, lauric acid has antimicrobial properties (kills microorganisms or stops their growth). However, unlike the last two mentioned, lauric acid has a slower metabolization process. Some people debate the fact that lauric acid should even be considered a MCT due to it’s larger size and longer time to metabolize. Lauric acid is the most inefficient of all the MCTs because it can’t be turned into energy as quickly as the others. Because of this, you won’t find it in a high-quality MCT oil. The shorter the carbon chain, the more efficiently the MCT will be turned into ketones. Fatty acids with longer carbon atoms are metabolized much slower. There are numerous benefits of MCTs — ranging from weight management and gut health to mental and physical advantages. However, more studies have been popping up showing that MCTs not only help you maintain satiety, but raise the metabolic rate at which your body functions — leading to greater weight loss and health outcomes[*][*][*]. Specifically, The Journal of Nutrition published a double blind placebo study demonstrating the difference between one group of subjects consuming MCTs and the other group of subjects consuming LCTs (long-chain triglycerides) for their fat intake. The rest of their nutritional intake was the same, the only difference being the type of fat they consumed[*]. Over the course of a 12-week period, there was about an eight and a half pound difference in overall body fat lost, and a loss in body weight too. This difference could be due to the fact that MCTs prevent fat accumulation through enhanced thermogenesis and fat oxidation — which helps your body produce ketones[*]. A double-blind study published in the Journal of Nutrition found that MCTs suppressed the accumulation of body fat in healthy men and women[*]. MCTs also have fewer calories than LCTs, with 8.3 calories per gram vs 9.2 calories per gram. In conclusion, MCTs can aid healthy weight-loss because they make you feel fuller for longer, don’t get store as fat, have lower calories, and boost your metabolism through their thermogenic effect, but the overall change is moderate. Harmful bacteria such as streptococcus, staphylococcus, neisseria and other bacteria known to cause viruses have been killed by MCTs. Your gut affects everything from energy expenditure to your ability to absorb vitamins and minerals, so it’s important to keep it balanced and healthy[*]. In conclusion, MCTs help keep a healthy balance of gut flora and improve the absorbability of nutrients. The journal Front Aging in Neuroscience recently published a study showing that subjects with memory impairment showed improvement in memory after supplementing with MCTs that produced higher ketone levels in the blood[*]. Additionally, MCTs have been shown to have a strong blood sugar stabilizing effect that may help reduce inflammation and improve brain function[*]. The European Journal of Clinical Nutrition published a study showing that the consumption of MCTs for 8 weeks resulted in a significant decrease (-14.54%) in blood triglyceride levels — a common marker of cardiovascular disease — in hypertriglyceridemic patients compared to consumption of LCT oil[*]. Another study published in the Journal of Nutrition supports the above findings showing that consumption of MCTs in overweight men lead to improvements in overall lipid profiles — specifically showing increases in LDL particle size (the big “fluffy” LDLs that are associated with decreased cardiovascular risk) [*]. Furthermore, a study from the journal of Metabolism concluded that overweight women consuming MCTs improved their overall cardiovascular risk profile [*]. However, in this study the MCTs were combined with phytosterols and omega-3 fatty acids so it is hard to conclude if the results were solely due to the MCTs themselves or the combination of these oils. In conclusion, MCTs might be able to help in the prevention of heart disease by keeping blood triglycerides stable and modestly reducing LDL (harmful) cholesterol. Studies have shown that MCTs play a possible role in the prevention and treatment of diabetes. Specifically, the journal of Diabetes and the journal of Metabolism published studies showing that MCT consumption improved insulin sensitivity — a key factor in diabetes prevention and management– in both diabetic patients and nondiabetic subjects[*][*]. Research is continuously emerging in this area but one fairly recent study published in the Journal of Nutritional Science and Vitaminology showed that recreational athletes significantly reduced blood lactate levels and rate of perceived exertion (RPE) during moderate-intensity exercise while also extending the duration of high-intensity exercise when consuming MCTs[*]. Another study from the Journal of Applied Physiology found that endurance-trained cyclists who consumed MCTs during moderate-intensity exercise for two hours had significant improvements in time-trial performance during high-intensity exercise[*]. The research in this area is still in its initial stages, but with more and more athletes making the conversion to low-carbohydrate, high-fat diets, there is no question that the scientific evidence will follow and the benefits for all different types of exercise will become more clear. Taking MCTs can significantly increase ketone levels within an hour. [*] This makes it ideal for taking it when you’re trying to start ketosis, get back into keto or need a boost of energy when you’re already in ketosis. MCT oil helps keep you satisfied and curb hunger, so it makes for a great ket-friendly snack. Instead of having butter coffee, you could add MCT oil to your coffee and reap even more health benefits while keeping hunger at bay. Adding MCT oil or MCT oil powder to your keto snacks helps you three-fold: its boosts ketones, gives you health benefits, and keeps you satiated. Aside from medium-chain triglycerides, there are also long-chain triglycerides (LCTs) or long chain fatty-acids, which have 13 carbons or more. LCTs require much more work by the body to process than MCTs because of their size. There are 17 recognized LCTs, including: myristic acid, palmitic acid, stearic acid, arachidonic acid, oleic acid, eicosenoic acid, erucic acid, nervonic acid, omega 3, omega 6, omega 9 fatty acids. While MCTs get to the liver in no time, LCTs require a bit more work. Due to their carbon size, they are not easily absorbed by the body and require pancreatic enzymes to break them down. After they’re broken down and absorbed, they are delivered to the lymphatic system and then transported to the liver, where they will finally become oxidized and available for energy. On the other hand, MCTs don’t need to be broken down at all. MCTs are transported directly to the liver where they are used immediately by the mitochondria and oxidized for energy. Interestingly, MCTs are not the smallest of the carbon sizes. Short-chain fatty acids (SCFAs) are fatty acids with fewer than 6 carbon atoms. SCFAs are created by the bacteria in your gut. The friendly bacteria in your microbiome produce these fatty acids and help provide your colon and its cell lining with energy and nutrition. While propionate is used to produce glucose in the liver, acetate and butyrate are both incorporated into other fatty acids. As you can see, MCT only incorporates medium-chain triglycerides because they’re the best at energy product in comparison to long-chain fatty acids. 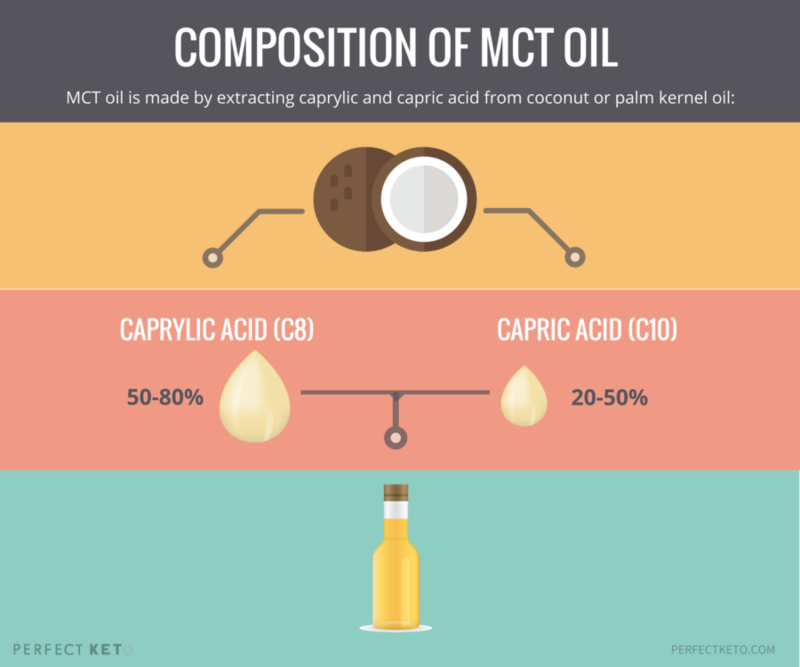 MCT oil is often confused with coconut oil, but they’re not the same. 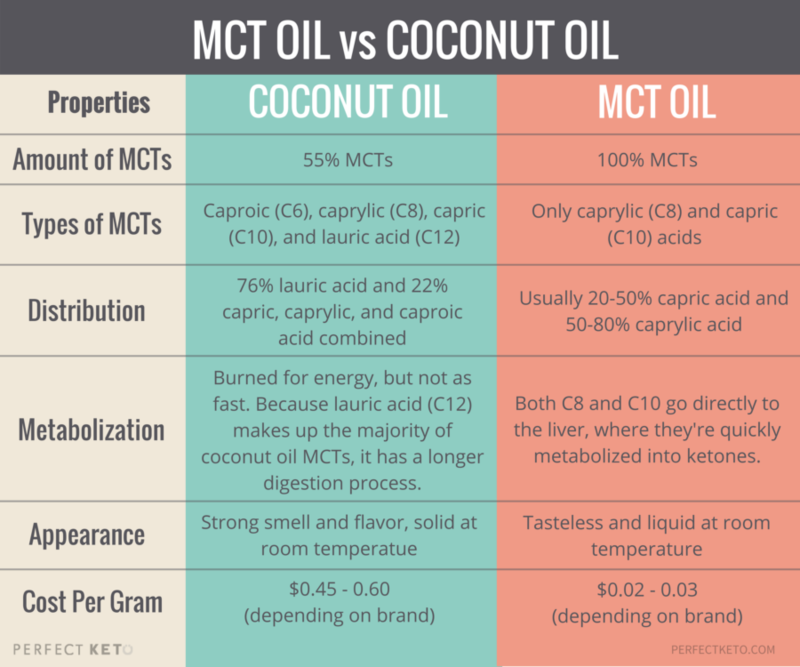 The main difference between MCT oil and coconut oil is their MCT content. 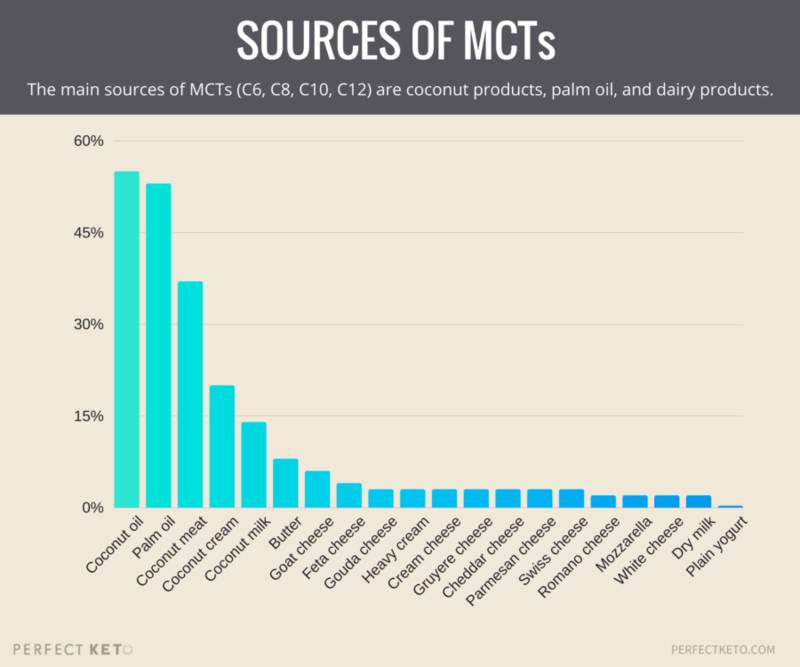 Coconut oil is 55% MCTs, while MCT oil is made 100% of MCTs. Furthermore, coconut oil contains all 4 medium-chain fatty acids, including large quantities of lauric acid, the least efficient MCT. MCT oil only uses the two most efficient MCTs for energy: caprylic and capric acid. MCT oil is actually a byproduct of coconut oil. You could think of MCT oil as the fast lane to getting the most efficient fats from coconut oil. Coconut oil and MCT oil have different benefits. If you’re looking to stay healthy and simply add more MTCs to your diet, coconut oil is enough. However, if you’re looking to gain all the advantages of pure MCTs and fuel your body with ketones, MCT oil is the best choice. MCT oil is a man-made oil blend that combines two of the best MCTs: caprylic and capric acids. Scientists distill these two fatty acids because they’re the most absorbable and turn into energy quickly in comparison to the other MCTs. Natural foods don’t have high enough levels of these fats, and when they’re present, they’re usually combined with less efficient fats like lauric acid. This prevents your body from metabolizing MCT fats for energy quickly. Even though it’s man-made, the fats in MCT oil are completely natural. The MCTs are taken from fatty foods rich in MCTs, mainly coconut oil and palm kernel oil. Step 1. Sourcing high-quality coconut oil. Step 2. Fractionation. This is where caprylic (C8) and capric (C10) acid are extracted and separated from the rest of fats. Step 3. Lipase Esterification. This is a chemical process that produces triglycerides, with the help of an enzyme called lipase. Step 4. Filtration to remove lipase. Step 6. Bleaching and Deodorizing. Depending on the brand, the ratio of C8:C10 may vary. 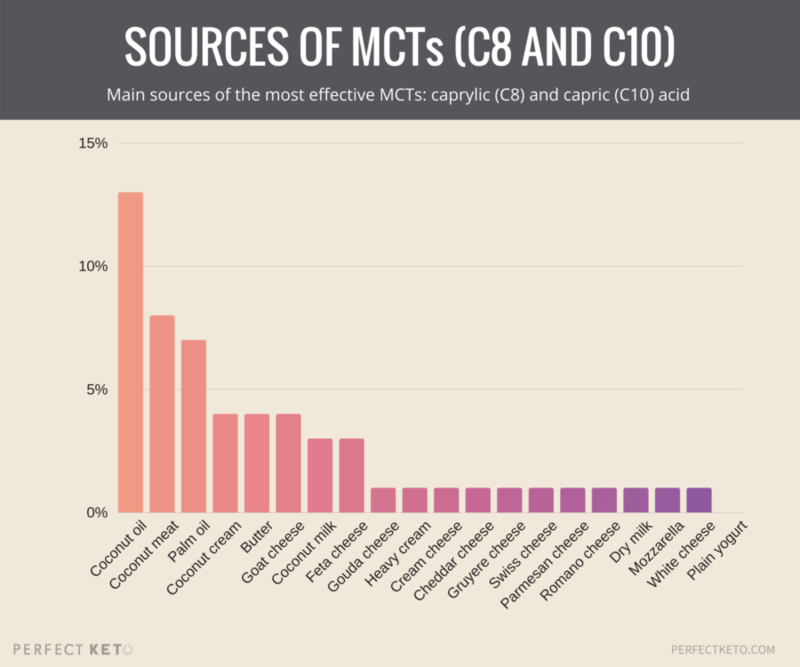 Most MCT oils are a blend of C8 and C10, although they could also be 100% either caprylic acid or capric acid. Caprylic acid tends to be the majority because it’s more efficient than C10. Lauric acid and caproic acid are entirely removed. Tasteless: MCT oil doesn’t have a taste or smell because it’s removed during the “bleaching and deodorizing” phase. Liquid at room temperature: The final product has a lower smoking point than coconut oil, so it will be liquid at room temperature. Highly absorbable: A quality MCT oil will quickly turn into energy. Generic MCT oils could be blended with lauric acid or other fats to cut costs, making your supplementation ineffective, so always know what you’re buying by reading labels. Highly soluble: The small size of the carbon molecules in MCT oil increases its solubility in water and biological fluids like blood. MCT oil is powerful because it helps make ketones readily available for your body to use, making ketosis easy to achieve and maintain. In conclusion, MCTs can be quickly converted into ketones because they need less steps to be metabolized in your cells. MCT oil provides the most effective MCTs that turn into energy faster. MCT oil or MCT oil powder is perfect in your morning coffee, salads or added into protein shakes. Just one tablespoon contains about 100 calories and 14 grams of fat. The amount and types of MCTs present in whole foods are highly variable. Generally, coconut oil, coconut-derived products, and palm oil have higher concentrations of lauric acid than capric or caprylic acid, while dairy products have relatively low concentrations of lauric acid and more capric and caprylic acid. Most whole foods have a combination of the 4 types of MCTs in varying degrees. The richest sources are coconut, palm oil, and dairy products. As you can see, lauric acid is responsible for the majority of MCTs in coconut and palm oil, and unfortunately it’s the least efficient fatty acid. That’s why only caprylic and capric are extracted when making MCT oil. As you can see, the content of the effective fatty acids C8 and C10 is relatively low in whole foods. That’s one of the advantages of supplementing with MCT oil – you get a high concentrated dose of MCTs that convert quickly to ketones without having to eat big quantities of any particular food to get the same benefits. To consume the same amount of C8 and C10 you find in one teaspoon of MCT oil, you’d have to eat several tablespoons of coconut oil. If you’re new to MCT oil, start off with small amounts. Begin with one teaspoon a day and slowly increase your intake to get your body accustomed to the MCTs. Once your body begins to adjust to the metabolization process, then you can increase to a tablespoon a day or however much you prefer. A little goes a long way and due to it’s lack of taste or smell, it can be added to almost anything. Research hasn’t yet found a lethal dose for MCT oil, even when they have fed rats a dose equivalent to 1.7 cups of MCT oil for a 70 kg person[*]. Some people report having diarrhea when starting to consume MCT oil, so it’s important you begin with a small dose and test how your body responds to it. You can also try MCT oil powder instead, because it’s easier on the stomach. MCT oil shouldn’t affect your digestion or have any side effects, but if you have a sensitive stomach it’s important to be cautious. MCT oil can last up to 2 years in a dry, cool place. Coffee and other warm drinks: MCT oil is great to take before you need your brain to be working at it’s ultimate level. Adding it into your bulletproof coffee in the morning not only guarantees your intake of healthy fats, but provides the ultimate energy for your body and brain to start the day. Try it in the Perfect Keto Frappucino. Smoothies: Add 1 tbsp of MCT oil to your daily smoothie for a boost of healthy fats. Try the Low-Carb Acai Almond Butter Smoothie. Pre-workout and post-workout shakes: Don’t feel like you have to restrict your MCTs to the mornings — MCTs provide an amazing source of energy for workouts, especially high intensity training. Supplementing your pre or post-workout meal with a tablespoon of MCT oil is guaranteed to improve both training intensity and recovery. MCT oil as a pre-workout supplement can be great for individuals just starting the keto diet who usually increase their carb intake around their workout times for sufficient energy. Wondering if you can use MCT oil for cooking? You can, as long as you’re cooking at a low temperature or making raw snacks. Because it has a low smoking point, MCT oil should not be heated to temperatures above 150-160°C. High temperatures will oxidize and breakdown the oil. The smoking point of MCT oil is similar to the one of extra-virgin olive oil (165-190°C), so treat it the same when cooking. Replace olive oil with MCT oil when making pesto. Use it in salads. Unlike coconut oil, MCT oil is liquid at room temperature and has no taste. This makes it perfect to add as a dressing in salads. Use it in marinades and sauces. Drizzle it over zucchini pasta. Mix it with cacao powder to make a quick chocolate sauce that you can drizzle over snacks and berries. Did you know you could consume MCT oil in powder form? MCT oil powder is more practical and even less detectable than MCTs in oil form. The Perfect Keto MCT Oil Powder is ideal for individuals looking for a powder form of MCT oil. Looking for ways to incorporate MCT oil powder in your diet? Try Anti-Inflammatory MCT Fat Bombs. They’re a great snack to grab on-the-go with a prep time of less than five minutes. If you’re looking for something to satisfy that sweet tooth, these Mocha Fat Bombs are another option that are sweet and satiating for the chocolate lover in all of us. Whether it’s in oil form or powder form, the benefits of MCT oil make it the ultimate addition to any meal or time of day. Start improving all aspects of your health by adding MCT oil to your daily regimen today. good details, keep up the great work! I will certainly start using MCT oil,hoping it will help me with my Ketogenic diet that I have been on for three months now. I am just exhausted all the time. 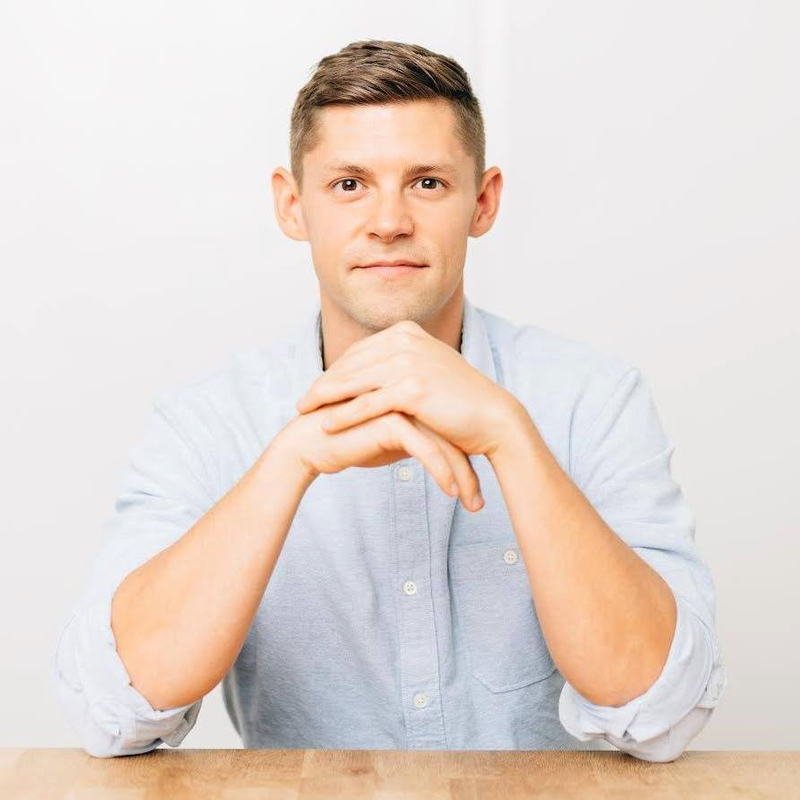 Is it possible that this diet doesn’t work for everyone? How shall I introduce other food back into it if it is the case. I am so disappointed. I also have not lost any weight. Great article written in layman terms Many thanks. Will surely use it on a trial basis. I am allergic to coconut, so I should avoid MCT too? So much information! Thanks for all the tips! I’ve introduced it to all my family. I was using the solid coconut oil and I’m now transitioning to MCT oil.